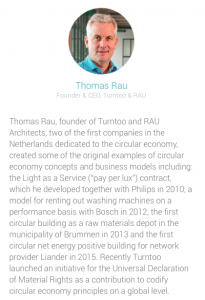 Thomas Rau, founder of Turntoo and RAU Architects, finalist of The Circulars Award 2016 – The world’s premier circular economy award program, in the Fortune Award for Circular Economy Leadership category. 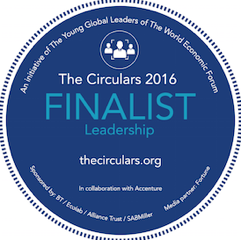 Thomas Rau, founder RAU Architects and Turntoo, has been shortlisted for The Circulars Award 2016 – The world’s premier circular economy award program, in the Fortune Award for Circular Economy Leadership category. Awards will be presented in a ceremony at the World Economic Forum Annual Meeting in Davos in January 2016. Other finalists in the Leadership category include, among others, Else Bos, CEO of PGGM and Estelle Brachlianoff, Senior Vice-President UK Veolia. 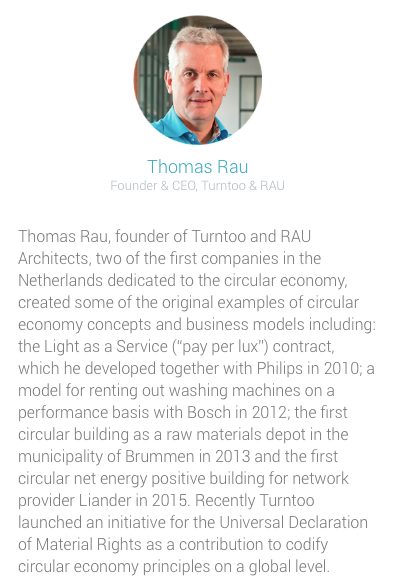 Motivation from the jury: Thomas Rau, founder of Turntoo and RAU Architects, two of the first companies in the Netherlands dedicated to the circular economy, created some of the original examples of circular economy concepts and business models including: the Light as a Service (“pay per lux”) contract, which he developed together with Philips in 2010; a model for renting out washing machines on a performance basis with Bosch in 2012; the first circular building as a raw materials depot in the municipality of Brummen in 2013 and the first circular net energy positive building for network provider Liander in 2015. Recently Turntoo launched an initiative for the Universal Declaration of Material Rights as a contribution to codify circular economy principles on a global level.